Oslo, 29 November 2018 – Norwegian Environmental Agency (Miljødirektoratet) held a conference for Programme Operators responsible for environmental programmes and potential project partners from Norway. 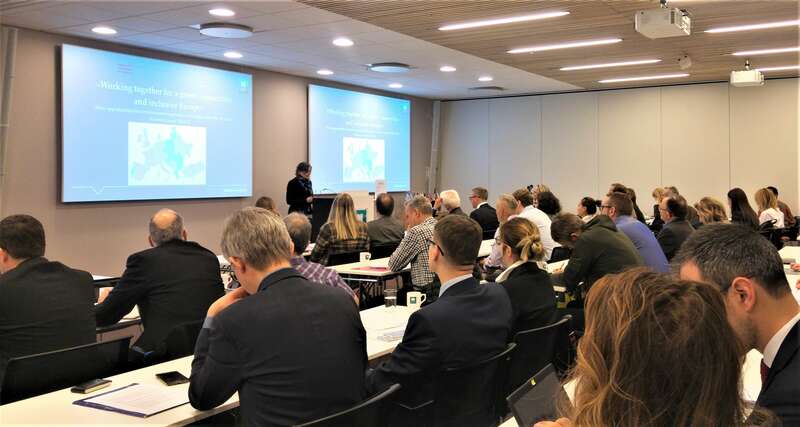 The conference aimed to present environmental programmes and opportunities for cooperation of beneficiary countries of the EEA and Norway Grants, as well as to identify the interest of Norwegian organizations in taking part in potential projects. Slovenia was one of the eleven countries presenting its environmental programme. While the budgets of environmental programmes of other beneficiary countries surpass EUR 120 million, compared to a budget of EUR 14.5 million in Slovenia, we have still managed to raise the interest of Norwegian institutions in cooperating with potential Slovenian partners. The programme concept note is currently being prepared in Slovenia; the document will serve as the basis for signing the Programme Agreement for the Climate Change Mitigation and Adaptation Programme. Once the Programme Agreement has been signed, a call for proposals will be prepared and launched and Slovenian environmental programme promoted. Potential applicants will begin searching for project partners from donor countries. As the Programme Operator, GODC will be able to help potential applicants find project partners from Norway on the basis of successful networking at the kick-off conference. Stakeholders Consultations under the Active Citizen Fund MAKE YOUR PROJECT EVEN STRONGER WITH A PARTNER!